123 – 4th Apartments are designed using the Leadership in Energy & Environmental Design (LEED) Rating System, the world’s foremost third-party green building rating system. These apartment homes will offer green amenities and features to residents, businesses and visitors, with quantifiable measures to earn a Silver LEED Rating. 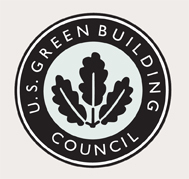 This independent third party rating created by the U.S. Green Building Council recognizes projects that go above and beyond conventional building methods when it comes to saving forests, reducing impacts on salmon and habitat, using healthier building products, and minimizing CO2 emissions through more efficient electricity use. With the LEED label, you know that a third party has verified the things most people won’t ever see, from the reduced toxins in the air to the extra insulation in the walls. Click here to view more information about the LEED rating system. Why are green buildings important? A green or “sustainable” building is a structure be it new construction or renovation, that incorporates design strategies for technologies and materials that reduce its dependence on fossil fuels and minimize its harmful impact on the environment. One of the greatest benefits of green buildings is a decrease of energy use which helps reduce our dependence on fossil fuels. * Turner, C. and Frankel, M. (2008), Energy Performance of LEED for New Construction Buildings. Final Report. ** Katz, G. (2003). The Costs and Financial Benefits of Green Building. A Report to California’s Sustainable Building Task Force. *** GSA Public Building Service (2008). Assessing Green Building Performance. A post-occupancy evaluation of 12 GSA buildings. To read more about 123-4th’s LEED features click here.